Blanche of Castile (Spanish: Blanca; 4 March 1188 – 27 November 1252) was Queen of France by marriage to Louis VIII. She acted as regent twice during the reign of her son, Louis IX: during his minority from 1226 until 1234, and during his absence from 1248 until 1252. She was born in Palencia, Spain, 1188, the third daughter of Alfonso VIII, King of Castile, and Eleanor of England. In her youth, she visited the Abbey of Santa María la Real de Las Huelgas, founded by her parents, several times. In consequence of the Treaty of Le Goulet between Philip Augustus and John of England, Blanche's sister, Urraca, was betrothed to Philip's son, Louis. 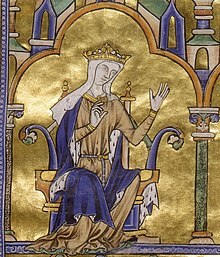 Their grandmother Eleanor of Aquitaine, after meeting the two sisters, judged that Blanche's personality was more fit for a queen consort of France. In the spring of 1200, Eleanor crossed the Pyrenees with her and brought her to France instead. On 22 May 1200 the treaty was finally signed, John ceding along with his niece the fiefs of Issoudun and Graçay, together with those that André de Chauvigny, lord of Châteauroux, held in Berry, of the English crown. The marriage was celebrated the next day, at Port-Mort on the right bank of the Seine, in John's domains, as those of Philip lay under an interdict. Blanche was twelve years of age, and Louis was only a year older so the marriage was consummated a few years later. Blanche bore her first child in 1205. During the English barons' rebellion of 1215-16 against King John, it was Blanche's English ancestry as granddaughter to Henry II that led to Louis being offered the throne of England as Louis I. However, with the death of John in October 1216, the barons changed their allegiance to John's son, the nine-year-old Henry. Louis continued to claim the English crown in her right, only to find a united nation against him. Philip Augustus refused to help his son, and Blanche was his sole support. Blanche raised money from her father-in-law by threatening to put up her children as hostages. She established herself at Calais and organized two fleets, one of which was commanded by Eustace the Monk, and an army under Robert I, Latin Emperor. With French forces defeated at Lincoln in May 1217 and then routed on their way back to their London stronghold, Louis desperately needed the reinforcements from France. On 24 August, the English fleet destroyed the French fleet carrying those reinforcements off Sandwich and Louis was forced to sue for peace. Philip died in July 1223, and Louis VIII and Blanche were crowned on August 6. Upon Louis' death in November 1226 from dysentery, he left Blanche, by then 38, regent and guardian of his children. Of her twelve or thirteen children, six had died, and Louis, the heir — afterwards the sainted Louis IX — was but twelve years old. She had him crowned within a month of his father's death in Reims and forced reluctant barons to swear allegiance to him. The situation was critical, since Louis VIII had died without having completely subdued his southern nobles. The king's minority made the Capetian domains even more vulnerable. To gain support, she released Ferdinand, Count of Flanders, who had been in captivity since the Battle of Bouvines. She ceded land and castles to Philip I, Count of Boulogne, son of Philip II and his controversial wife, Agnes of Merania. Several key barons, led by Peter Mauclerc, refused to recognize the coronation of the young king. Shortly after the coronation, Blanche and Louis were traveling south of Paris and nearly captured. Blanche appealed to the people of Paris to protect their king. The citizens lined the roads and protected him as he returned. In 1229, she was responsible for the Treaty of Paris, in which Raymond VII, Count of Toulouse, submitted to Louis. By the terms of the agreement, his daughter and heir, Joan, married Blanche's son, Alphonse, and the county could only pass to his heirs. He gave up all the lands conquered by Simon de Montfort to the crown of France. It also meant the end of the Albigensian Crusade. To prevent Henry III of England from gaining more French lands through marriage, Blanche denied him the first two brides he sought. In 1226, he sought to marry Yolande of Brittany, Mauclerc's daughter. Blanche instead forced her father to give Yolande to Blanche's son John. When Henry became engaged to Joan, Countess of Ponthieu, Blanche lobbied the Pope to deny the marriage based on consanguinity, denying the dispensation Henry sought. In 1230, Henry III came to invade France. At the cost of some of the crown's influence in Poitou, Blanche managed to keep the English Queen mother Isabelle, Countess of Angoulême and her second husband, Hugh X of Lusignan, from supporting the English side. Mauclerc did support the English and Brittany rebelled against the crown in 1230. The rebellion was put down, which added to the growing prestige of Blanche and Louis. Henry's failure to make any significant impact with his invasions ultimately discouraged Mauclerc's rebellion, and by 1234 he was firm in his support of Louis. St. Louis owed his realm to his mother and remained under her influence for the duration of her life. In 1233, Raymond of Toulouse was starting to chafe under the terms of the treaty of Paris, and so Blanche sent one of her knights, Giles of Flagy, to convince him to cooperate. Blanche had also heard through troubadours of the beauty, grace, and religious devotion of the daughters of Ramon Berenguer IV, Count of Provence. So she assigned her knight a second mission to visit Provence. Giles found a much better reception in Provence than in Toulouse. Upon his return to Paris, Blanche decided that a Provençal marriage would suit her son and help keep Toulouse in check. In 1234, Louis married Margaret of Provence, who was the eldest of the four daughters of Ramon, Count of Provence, and Beatrice of Savoy. She did not have a good relationship with her daughter-in-law, perhaps due to the controlling relationship she had with her son. To maintain better control over the new queen, Blanche dismissed the family and servants who had come to her wedding before the couple reached Paris. Prior to the arrival of the new queen, Blanche was considered the beauty of the court, and had poems written about her beauty by the count of Champagne. In 1230, it was even rumoured that she was pregnant by Romano Bonaventura. The new queen drew the attention of the court and the king away from Blanche, so she sought to keep them apart as much as she could. Jean de Joinville tells of the time when Queen Margaret was giving birth and Blanche entered the room telling her son to leave saying "Come ye hence, ye do naught here". Queen Margaret then allegedly fainted out of distress. One contemporary biographer notes that when Queen Blanche was present in the royal household, she did not like Margaret and Louis to be together "except when he went to lie with her". In 1239, Blanche insisted on a fair hearing for the Jews, who were under threat by increasing Antisemitism in France. She presided over a formal disputation in the king's court. Louis insisted on the burning of the Talmud and other Jewish books, but Blanche promised Rabbi Yehiel of Paris, who spoke for the Jews, that he and his goods were under her protection. In 1248, Blanche again became regent, during Louis IX's absence on the Crusade, a project which she had strongly opposed. In the disasters which followed she maintained peace, while draining the land of men and money to aid her son in the East. She fell ill at Melun in November 1252, and was taken to Paris, but lived only a few days. She was buried at Maubuisson Abbey, which she had founded herself. Louis heard of her death in the following spring and reportedly did not speak to anyone for two days afterwards. Blanche was a patron of the arts and owned a variety of books, both in French and in Latin. Some of these were meant as teaching tools for her son. Le Miroir de l'Ame was dedicated to Blanche. It instructs queens to rigorously practice Christian virtues in daily life. She oversaw the education of her children, all of whom studied Latin. She also insisted on lessons in Christian morals for all of them. Both Louis and Isabelle, her only surviving daughter, were canonized. Blanche (1205 – died soon after). Robert (25 September 1216 – 9 February 1250, killed in battle, Manssurah, Egypt), Count of Artois. Etienne (end 1225 – early 1227). Charles (21 March 1226 – 7 January 1285), Count of Anjou and Maine, by marriage Count of Provence and Folcalquier, and King of Sicily. Blanche of Castile is mentioned in François Villon's 15th century poem Ballade des Dames du Temps Jadis (Ballad of Ladies of Times Past), together with other famous women of history and mythology. Blanche's selection as bride for Louis and travel to France is noted in Elizabeth Chadwick's The Autumn Throne. Blanche and Isabella of Angoulême are the main characters in Jean Plaidy's novel The Battle of the Queens. Blanche of Castile is briefly mentioned in Marcel Proust's Swann's Way. Blanche is a key character in the novel "Four Sisters, All Queens", by Sherry Jones. An image of Blanche of Castile has been used on the home kit of French Rugby Union team Stade Français since the 2008 season. During the 1950s French restaurateur Noël Corbu claimed that Blanche of Castile had deposited a treasure in Rennes-le-Château that was later discovered by Bérenger Saunière during the late 19th century. This was later utilised by Pierre Plantard in his development of the Priory of Sion mythology. ^ Shadis 2010, p. 40-41. ^ a b c Wheeler & Parsons 2002, p. 192-193. ^ a b c d One or more of the preceding sentences incorporates text from a publication now in the public domain: Chisholm, Hugh, ed. (1911). "Blanche of Castile" . Encyclopædia Britannica. 4 (11th ed.). Cambridge University Press. p. 40. Paulin Paris, "Nouvelles recherches sur les mœurs de la reine Blanche et de Thibaud," in Cabinet historique (1858). ^ Gies & Gies 1978, p. 103. ^ Weiler et al. 2007, p. 53. ^ a b Abulafia 1999, p. 286-287. ^ Jackson 1999, p. 64. ^ Labarge 1997, p. 193. ^ Klaniczay 2002, p. 236. ^ Bradbury 2007, p. 213. ^ Nolan 2003, p. 181-182, 212. ^ Kerrebrouck records the birth of this daughter, and her death soon after her birth. P. Van Kerrebrouck, Les Capétiens 987-1328, Villeneuve d'Asq, 2000, p. 124; Père Anselme notes [une] fille née en 1205 et mourut jeune as the eldest child of Louis VIII and Blanche of Castile. Père Anselme, Tome I, p. 83. ^ His existence is disputed. ^ Putnam & Wood 2005. Abulafia, David (1999). The New Cambridge Medieval History: c. 1198-c. 1300. ISBN 978-0521362917. Bradbury, Jim (2007). The Capetians: Kings of France, 987-1328. Continuum Books. ISBN 9780826424914. Gies, Frances; Gies, Joseph (1978). Women in the Middle Ages. Harper & Row. ISBN 978-0064640374. Jackson, Guida M. (1999). Women rulers throughout the ages: an illustrated guide. ABC-CLIO, Inc. ISBN 978-1576070918. Klaniczay, Gábor (2002). Holy rulers and blessed princesses: dynastic cults in medieval central Europe. Cambridge University Press. ISBN 978-0521420181. Labarge, Margaret W. (1997). A medieval miscellany. Canada: Carleton University Press. ISBN 978-0886292904. Nolan, Kathleen D. (2003). Capetian Women. ISBN 978-0312294489. Putnam, Bill; Wood, John Edwin (2005). The Treasure of Rennes-le-Château: A Mystery Solved. Sutton Publishing. ISBN 978-0-7509-4216-4. Weiler; Burton; Schofield; Stöber (2007). Thirteenth century England: Proceedings of the Gregynog Conference. The Boydell Press. ISBN 9781846157707. Wheeler, B.; Parsons, J. (2002). Eleanor of Aquitaine: Lord and Lady. Palgrave Macmillan. Wright, Hannah (16 October 2008). "French rugby fans blanche at multi-coloured shirt". The Independent. Retrieved 21 October 2009. Aside from the works of Joinville and William of Nangis, see Élie Berger, "Histoire de Blanche de Castille, reine de France", in Bibliothèque des Ecoles françaises d'Athènes et de Rome, vol. lxx. (Paris, 1895); Le Nain de Tillemont, "Vie de Saint Louis", ed. by J. de Gaulle for the Société de l'histoire de France (6 vols., 1847–1851); and Paulin Paris, "Nouvelles recherches sur les mœurs de la reine Blanche et de Thibaud", in Cabinet historique (1858). Wikimedia Commons has media related to Blanche of Castile. Women's Biography: Blanche of Castile, queen of France, epistolae.ccnmtl.columbia.edu; accessed 14 April 2014.